We evaluated TLR function in primary human dendritic cells (DCs) from 104 young (age 21–30 y) and older (≥65 y) individuals. We used multicolor flow cytometry and intracellular cytokine staining of myeloid DCs (mDCs) and plasmacytoid DCs (pDCs) and found substantial decreases in older compared with young individuals in TNF-α, IL-6, and/or IL-12 (p40) production in mDCs and in TNF-α and IFN-α production in pDCs in response to TLR1/2, TLR2/6, TLR3, TLR5, and TLR8 engagement in mDCs and TLR7 and TLR9 in pDCs. These differences were highly significant after adjustment for heterogeneity between young and older groups (e.g., gender, race, body mass index, number of comorbid medical conditions) using mixed-effect statistical modeling. Studies of surface and intracellular expression of TLR proteins and of TLR gene expression in purified mDCs and pDCs revealed potential contributions for both transcriptional and posttranscriptional mechanisms in these age-associated effects. Moreover, intracellular cytokine production in the absence of TLR ligand stimulation was elevated in cells from older compared with young individuals, suggesting a dysregulation of cytokine production that may limit further activation by TLR engagement. Our results provide evidence for immunosenescence in DCs; notably, defects in cytokine production were strongly associated with poor Ab response to influenza immunization, a functional consequence of impaired TLR function in the aging innate immune response. Aging is associated with a progressive decline in immune function (immunosenescence) resulting in increased susceptibility to viral and bacterial infections and decreased response to vaccines (1–3). Age-associated perturbations in the humoral and cell-mediated arms of the adaptive immune system are well documented (3, 4); however, the impact of aging on the innate immune system is less well defined. Age-related deficiencies of the innate immune system are incompletely understood but include reduced recruitment, phagocytosis, granule release, and microbial activity by PMN or macrophages, suggesting an age-related dysfunction in signal transduction as a manifestation of immunosenescence (5–9). TLRs are pattern recognition receptors that recognize conserved molecular patterns on microbes and are key to triggering antimicrobial host-defense responses (10). Recognition of microbial components by TLRs initiates MyD88 or Toll/IL-1 resistance domain-containing adaptor-inducing IFN-β–dependent signal transduction pathways, resulting in the elaboration of type I IFNs and proinflammatory cytokines that facilitate the linkage of innate to adaptive immune responses (11). Deficiencies in human TLR signaling lead to increased severity of several diseases, including sepsis, immunodeficiencies, atherosclerosis, and asthma (12). We previously evaluated TLR function in monocytes and macrophages in the context of human aging and observed an age-associated deficit in TLR1/2-induced cytokine production associated with reduced surface expression of TLR1 in monocytes and dysregulation of TLR3 expression in macrophages (13, 14). 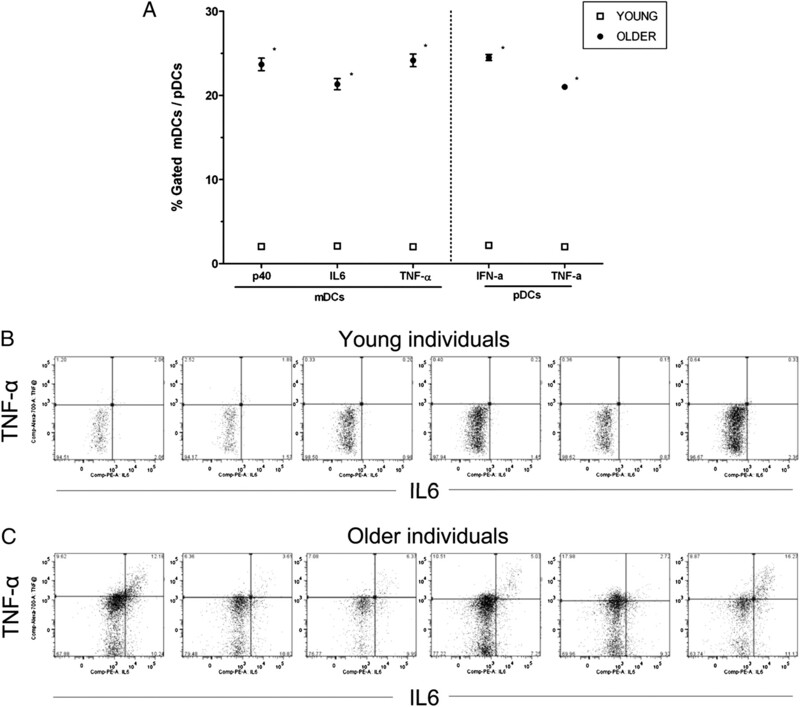 Monocytes from older individuals also demonstrated a generalized age-associated defect in TLR-induced expression of the CD80 costimulatory molecule associated with reduced protective Ab responses to influenza immunization (15). Similar reduced levels of TLRs have been noted in whole blood samples and colonic biopsies from older individuals (16) and in macrophages and plasmacytoid dendritic cells (pDCs) from aged mice (17–19); other studies in different inbred mouse strains have implicated signaling differences in the absence of age-associated alterations in TLR expression (20, 21). Dendritic cells (DCs) are professional APCs that play a pivotal role in the linkage between innate and adaptive immunity (22). Human blood DCs, classified as myeloid DCs (mDCs) or pDCs, have distinct functional activities. 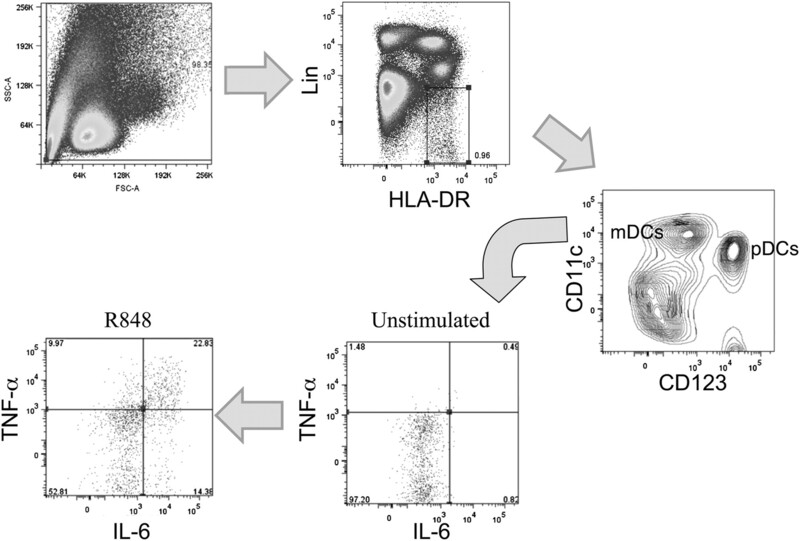 mDCs produce large amounts of IL-12 and induce strong Th1 and CTL responses (23). In contrast, pDCs produce large amounts of type I IFN in response to viral and bacterial stimuli. Stimulation of DCs and production of effector mechanisms involves phagocytosis, the upregulation of costimulatory and MHC molecules, a switch in chemokine receptor expression, the secretion of cytokines and chemokines, and the presentation of Ags by DCs (24). The consequences of aging on TLR function in human mDC and pDC populations remain incompletely understood. In this study, we report on age-associated alterations in TLR function in such cells and the consequences of age-associated alterations in innate immunity for vaccine responsiveness in humans. We recruited participants at vaccination clinics organized by the Yale University Health Services in October and November of 2007. Heparinized blood from healthy volunteers was obtained with informed consent under a protocol approved by the Human Investigations Committee of the Yale University School of Medicine. Older (age ≥65 y) or young (21–30 y) participants with no history of acute illness in the 2 wk prior to enrollment were evaluated. Immunocompromised individuals were excluded as described previously (14). After informed consent was obtained, participants were evaluated using a screening questionnaire, and self-reported information was collected that included demographic information, height, weight, medications, and comorbid conditions (with specific inquiries regarding coronary artery disease, congestive heart failure, peripheral vascular disease, stroke, diabetes, hypertension, peptic ulcer disease, kidney disease, and chronic lung disease). Human PBMCs were isolated using Ficoll-Hisopaque (Sigma-Aldrich, St. Louis, MO) gradient centrifugation. For FACS assays, DC populations were identified in PBMCs by staining with fluorescent Abs to specific surface markers. Circulating DC numbers were calculated by multiplying the percentage of DCs by the absolute count of PBMCs in the cell populations gated by light scatter in flow cytometry. For PCR assays, DCs were purified by sorting on FACSAria (BD Biosciences, San Jose, CA). Purified mDCs and pDCs were stored in RLT buffer (Qiagen, Valencia, CA) at −80°C for RNA isolation. For prevaccination samples, PBMCs were suspended in RPMI 1640 medium plus 10% FBS and adjusted to a concentration of 2 × 106 cells/ml. The following ligands in medium were added to PBMCs: TLR1/2 ligand (Pam3CSK4, 10 μg/ml), TLR2/6 ligand (lipoteichoic acid [LTA], 2 μg/ml), TLR3 ligand (polyinosinic:polycytidylic acid [poly I:C], 10 μg/ml), TLR5 ligand (flagellin, 5 μg/ml), TLR7/8 ligand (R848 0.5 μg/ml), and TLR9 ligand (CpG-ODN2216, 3 μg/ml). RPMI 1640 medium plus FBS alone was used in control cultures. All ligands were purchased from Invivogen (San Diego, CA). Cells were incubated for 6 h, and brefeldin A (GolgiStop, BD Biosciences) was added for the last 4 h of incubation to retain intracellular cytokines. Cell suspensions were labeled with primary Abs for surface staining as follows: lineage mixture (CD3 [Clone SK7], CD14 [Clone MphiP9], CD16 [3G8], and CD19 [SJ25C1])-APC-Cy7, HLA-DR–PE-Cy7, CD11c [B-ly6]-APC, and CD123 [9F5]–PE-Cy5. For analyses of surface TLR expression in unstimulated samples, Abs against TLR1 (PE, clone GD2.F4) and TLR2 (Alexa 700, clone TL2.1) were used; reagents and procedures for the analyses of intracellular TLR expression in unstimulated samples is described below. Anti-CD3, CD14, CD16, CD19, CD11c, CD123, TLR1, and TLR2 Abs were purchased from BD Biosciences. Cell surface labeling at 4°C was followed by washing in PBS containing 2% FBS. Cells were fixed in 4% paraformaldehyde, resuspended in 90% FBS containing 10% DMSO, and stored at –80°C. Samples obtained 4–6 wk postvaccination for analysis of TLR responses were incubated for 4 h in medium alone or with distinct TLR ligands as follows: TLR3 ligand (poly I:C, 50 μg/ml); TLR7 ligand (gardiquimod, 3 μM); TLR8 ligand (3M002, 10 μM) and TLR7/8 ligand (R848, 3 μg/ml). Brefeldin A was added for the last 2 h to retain intracellular cytokines. Cell suspensions were labeled, fixed, and frozen as described above. On the day of analysis, cells were thawed, permeabilized in BD Perm/Wash buffer (BD Pharmingen, San Diego, CA), pelleted at 500 × g for 10 min at 4°C, and resuspended in BD Perm/Wash buffer containing Abs for intracellular staining of cytokines or intracellular TLRs as follows: IL-6–PE (Clone MQ2-6A3), TNF-α Alexa 700 (Clone MAb11), IL-12 (p40)-Pacific Blue (Clone C8.6), IFN-α–FITC (Clone 225.2C), TLR3-biotin (Clone TLR3.7), TLR8-biotin (Clone 44C143), and TLR9-FITC (Clone 26C593.2), with appropriate isotype controls. Streptavidin-FITC was used as a secondary staining agent for TLR3-biotin and TLR8-biotin, and a biotinylated isotype control plus streptavidin-FITC was used for all experiments employing biotinylated Abs. IL-6, IL-12, and TNF-α Abs were purchased from BD Pharmingen. Ab to IFN-α was purchased from Chromaprobe (Maryland Heights, MO). TLR3-biotin was purchased from eBioscience (San Diego, CA), and TLR8-biotin and TLR9-FITC were purchased from Imgenex (San Diego, CA). Approximately 0.5–1 million total events were collected per sample using an LSR II instrument (BD Biosciences), with analysis using FlowJo software (Tree Star, Ashland, OR). Initial gating on parent DC subsets was further characterized by cytokine positive subpopulations. We used Boolean combinations of gated DC subsets in the three cytokine gates (IL-12, IL-6, and TNF-α) as described to uniquely discriminate responding cells based on their cytokine production (25). A random sample of 13 members of the original cohort (six young, seven older) were recalled for additional blood samples 20 to 21 mo after initial enrollment. PBMCs from these follow-up samples were subjected to DC isolation using magnetic bead sorting (Blood Dendritic Cell Isolation Kit II [Miltenyi Biotec, Auburn, CA]), first by depleting CD19- and CD14-positive cells, and then using positive selection with anti-BDCA3, anti-BDCA4, and anti-CD1c. Approximately 5 × 105 DCs (a mixture of mDCs and pDCs) were isolated from each participant using this procedure, and these cells were 70–85% pure using a live cell gate. Stimulations with Pam3CSK4, LTA, and R848 were carried out as described previously, and mDC and pDC populations were identified and interrogated for intracellular cytokine production by flow cytometry using the protocol described above, with the exception that cells were processed immediately for intracellular cytokine staining without fixation and freezing. Total RNA was harvested from purified mDC and pDC using the RNeasy mini kit according to the modified manufacturer’s instructions (Qiagen). Carrier RNA (4 ng/μl, Qiagen) was added to optimize the isolation. cDNA was synthesized using AffinityScript Multi Temperature cDNA Synthesis Kit (Stratagene, La Jolla, CA) according to standard protocols (13). Amplification was performed in an iCycler (Bio-Rad, Hercules, CA) for 60 cycles with an annealing temperature at 60°C as described (13). Primers and probes for quantitative PCRs (qPCRs) were synthesized according to customized sequences as follows: TLR3 (forward: 5′-CCT GGT TTG TTA ATT GGA TTA ACG A-3′, reverse: 5′-TGA GGT GGA GTG TTG CAA AGG-3′, probe: 5′-6FAM ACCCATACCAACATCCCTGAGCTGTCAA TAMRA-3′), TLR7 (forward: 5′-TTA CCT GGA TGG AAA CCA GCT A-3′, reverse: 5′-TCA AGG CTG AGA AGC TGT AAG CTA-3′, probe: 5′-6FAM-AGAGATACCGCAGGGCCTCCCGMGBNFQ-3′), TLR8 (forward: 5′-GGA AAG CAA GTC CCT GGT AGA ATT-3′, reverse: 5′-ACC TGT TGT CAT CAT CAT TCC ACA A-3′, probe: 5′-6FAM-ATTGCCACTGAAAACTMGBNFQ-3′), TLR9 (forward: 5′-GGA CCT CTG GTA CTG CTT CCA-3′, reverse: 5′-AAG CTC GTT GTA CAC CCA GTC T-3′, probe: 5′-6FAM-ACG ATG CCT TCG TGG TCT TCG ACA AAT MGBNFQ-3′), and β-actin (forward: 5′-ATC CTG GCC TCG CTG TCC AC-3′, reverse: 5′-GGG CCG GAC TCG TCA TAC-3′, probe: 5′-6FAMTCCAGCAGATGTGGATCAGCAAGCATAMRA-3′). The expression level of each gene in each sample was determined in duplicate, and results were normalized to β-actin as described (13). Significance was assessed by the Mann-Whitney U test using GraphPad Prism (GraphPad, San Diego, CA). A serum sample was collected from each subject before vaccination and ∼35 d (range, 28–42 d) after vaccination. Serum samples were separated into aliquots and stored at a temperature of –20°C or lower until assayed. We performed hemagglutination inhibition assays on pre- and postvaccine serum samples as described (26) to determine Ab titers against each of the strains of influenza included in the 2007–2008 influenza vaccine using Ag reagents specific to the vaccine. The composition of the vaccine was: A/Solomon Islands/3/2006, A/Wisconsin/67/2005, and B/Malaysia/2506/2004 (Fluzone, Sanofi Pasteur, Lyon, France). Serconversion to a strain in the vaccine was defined as a 4-fold or greater increase in Ab titer between pre- and postvaccine serum samples. We defined seroprotection as a postvaccine titer of ≥1:64. For the analyses of seroprotection, we excluded members of the cohort who had prevaccine titers of ≥1:64 because these individuals already met criteria for protection prior to vaccination. Consequently, the analysis of seroprotection included n = 32 young and n = 49 older for the H1N1 vaccine strain, n = 47 young and n = 30 older for H3N2, and n = 44 young and n = 34 older for the B strain. Proportions or means, where appropriate, were used to describe the demographic and clinical characteristics of each cohort at enrollment. To model both the variation in our sample of young and old adults as well as the correlation to ligand-specific stimulation, we employed a mixed-effects model to estimate the effect of age group on IL-6, IL-12, and TNF-α percentage change after stimulation in mDCs, and TNF-α and IFN-α levels percentage change after stimulation in pDCs in the cohort (27, 28). Specifically, we used an unstructured covariance structure that permitted each participant to have a unique correlation structure for each ligand stimulation; this accounted for the inherent variation of each participant. Tests of normality were applied to IL-6, IL-12, TNF-α, and IFN-α percentage change by cell type. The full models tested for the fixed effect of age group (older versus young), ligand, the interaction between age group and ligand, controlled for potential confounding by including the covariates gender, race, number of comorbid conditions (heart disease, stroke, peripheral vascular disease), and body mass index using restricted maximum likelihood. Least-squared means were estimated for the fixed effects of age group and age group by ligand interaction, and the differences were tested. Next, we estimated strain-specific seroconversion and seroprotection in the cohort using generalized linear models controlling confounding by the same covariates listed above (29). Then, we estimated the effect of age group on the number of strain seroprotected and seroconverted using Poisson regression controlling confounding by covariates listed above (29). For models of seroprotection, only those with prevaccination titers <1:64 were included. Subsequently, we used mixed-effects models to estimate the effect of seroconversion and seroprotection on the IL-6, IL-12, and TNF-α percentage change after stimulation in mDCs and TNF-α and IFN-α levels percentage change after stimulation in pDCs; again, each of these models was adjusted for correlations between ligand-specific stimulation and covariates (29). We used multivariable linear regression to estimate the effect of age group on the percent-positive cells expressing specific TLR proteins, controlling for confounding by covariates listed above. To test whether there were differences between the young and older age groups for the enriched DC populations, we used a t test. Statistical tests were two-tailed and p < 0.05 considered to indicate statistical significance. Analyses used SAS version 9.1 (SAS Institute, Cary, NC). We evaluated TLR function in DCs from 50 younger (age 21–30 y) and 54 older (age ≥65 y) individuals prior to influenza immunization. Clinical and demographic characteristics of participants are shown in Table I. Notably, the older individuals evaluated represented a generally healthy group, with nearly 75% reporting no comorbid illnesses. Heterogeneity was found in the young versus older group in terms of gender, race, and number of comorbid illnesses, reflecting the expected consequences of aging and differences in composition of the two age groups; we used mixed-effects multivariable statistical modeling to adjust for potential confounding by these covariates as in our previous work (14). To elucidate the consequences of aging on TLR function in primary human DCs, we employed multicolor flow cytometry and intracellular cytokine staining in PBMC samples from young and older participants. An example of this analysis is shown in Fig. 1; we gated on a lineage-negative (consisting of a mixture of Abs against CD3, CD14, CD16, and CD19), HLA-DR–positive population, with mDCs and pDCs subsequently identified using staining against CD11c and CD123. We found that although the number of mDCs did not change between the young and older groups, the number of circulating pDCs decreased significantly (p < 0.01; n = 36 young, n = 34 older) from 3725 ± 472 cells/ml to 1975 ± 194 cells/ml in young and older groups, respectively, consistent with previous reports of reduced type I IFN production or lower numbers of pDCs in aging (30–32). Representative example of identification of mDC and pDC populations from peripheral blood. Lin– HLA-DR+ cells were further fractionated into CD11c+ (mDC) or CD123+ (pDC) populations. In this example, following treatment with R848, production of TNF-α and IL-6 are evaluated using intracellular cytokine staining, gating in this case on mDCs. Using intracellular cytokine staining, we evaluated mDCs for the production of TNF-α, IL-6, and the p40 subunit of IL-12/23 (IL-12p40) following treatment with TLR ligands as follows: Pam3CSK4 (TLR1/2), LTA (TLR2/6), poly I:C (TLR3), flagellin (TLR5), and R848 (TLR7/8). In general, we observed decreased production of TLR-induced cytokines in mDCs from older compared with young individuals, including lower levels of TNF-α, IL-6, and IL-12/p40 (Fig. 2A). In addition, pDCs from older individuals produced decreased levels of TNF-α and IFN-α after treatment with the TLR ligands R848 (TLR7/8) and CpG (TLR9) (Fig. 2B). These differences were highly statistically significant after adjustment for covariates including gender, race, body mass index, and number of comorbid conditions. Age-associated alteration in TLR-induced cytokine production in mDCs and pDCs in older compared with young adults. 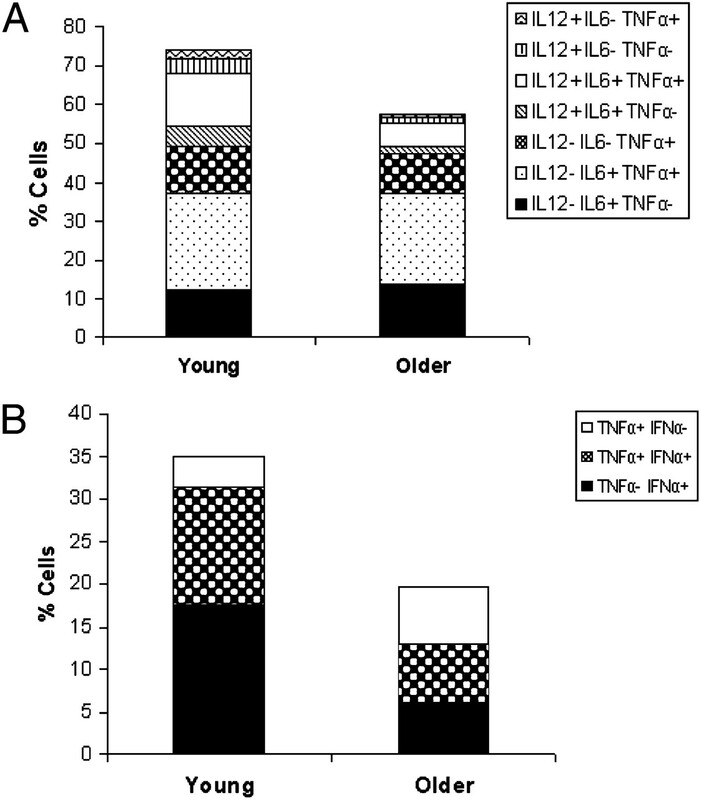 A, Age-associated decrease (n = 50 young, n = 54 older) in IL-12p40, IL-6, and TNF-α production in mDCs (as measured by intracellular cytokine staining) following stimulation with indicated TLR ligands. B, Age-associated decrease in IFN-α and TNF-α production in pDCs (n = 50 young, n = 54 older) following stimulation with R848 and CpG. Stable decrease in TLR8-induced cytokine production in mDCs (C) and in TLR7-induced cytokine production in pDCs (D), assessed both with R848 and TLR7- or TLR8-specific agonists 4–6 wk after studies in A and B (n = 36 young, n = 34 older). Each plot depicts the mean ± SEM percent positive difference in intracellular cytokine production between samples stimulated with the indicated TLR ligand and unstimulated samples. p Values after adjustment for covariates are indicated: *p < 0.0001; # p < 0.01; $ p < 0.05; & p < NS). We re-evaluated a subset of our cohort 6 wk later with new blood samples to assess the stability of responses to selected TLR ligands and to provide a more in-depth examination of those receptors recognizing components of nucleic acids, such as in the course of influenza or other viral infections. We repeated stimulation with R848 (TLR 7/8) and, in addition, used more selective ligands for TLR7 and TLR8 (gardiquimod and 3M-002, respectively). In keeping with our initial observations, mDCs from older compared with young individuals produced lower levels of IL-6, TNF-α, and IL-12 in response to both R848 and 3M-002. In addition, we found that gardiquimod or R848 engagement of TLR7 in pDCs resulted in diminished IFN-α production in pDCs from older compared with young individuals (Fig. 2C, 2D). These findings indicate that at least for TLR7 and TLR8, the age-associated alterations in cytokine responses we observed are stable over time. Taken together, these results reveal a generalized decrease in TLR-induced cytokine production in primary human mDCs and pDCs. Reduced production of cytokines by DCs in older individuals may be especially relevant for particular subpopulations of cells. Distinct populations of cytokine-producing cells can be delineated at the single-cell level based on the combination of cytokines produced. To reveal age-dependent differences, we have employed Boolean gating strategies that allow rapid comparison of distinct subpopulations of stimulated DCs (25). The response of mDCs and pDCs to R848 stimulation is depicted (Fig. 3). It is readily apparent that both age groups have equivalent populations of single-positive mDCs that produce IL-6 and/or TNF-α with low expression of IL-12. However, the most significant difference between mDCs of young versus older individuals is in the multifunctional triple positive cells that simultaneously produce IL-12, IL-6, and TNF-α, which are dramatically lower in DCs from older subjects (Fig. 3A). For pDCs, whereas overall production of cytokines was reduced in pDCs from older individuals, the total subpopulation of IFN-negative cells is actually larger in pDCs from older compared with young participants (Fig. 3B). Boolean gating of DC subpopulations. A, The frequency of mDCs expressing each of the seven possible combinations of IL-6, TNF-α, and IL-12 (p40) after stimulation with the TLR7/8 ligand R848. B, The frequency of pDCs expressing each of the three possible combinations of IFN-α and TNF-α after stimulation with R848. Our observation of decreased TLR-induced cytokine production contrasts with the proinflammatory milieu associated with elevated levels of IL-6, TNF-α, and other cytokines in older individuals, so called “inflamm-aging” (33). Because of this, we compared levels of cytokine production as measured by intracellular cytokine staining in DC populations that were not subjected to TLR ligand stimulation. Notably, we observed markedly elevated levels of p40, TNF-α, and IL-6 in mDCs and of TNF-α and IFN-α in pDCs, in older compared with young individuals (Fig. 4); these differences were highly statistically significant. Taken together, these data indicate that basal levels of cytokine production are elevated in DCs from older individuals and that TLR ligand stimulation of such cells results in a smaller increase in cytokine production than in DCs from young participants. Basal cytokine levels in older compared with young adults. A, Baseline IL-12 (p40), IL-6, and TNF-α production in mDCs (as measured by intracellular cytokine staining) and IFN-α and TNF-α production in pDCs (n = 50 young, n = 54 older). The mean ± SEM percent positive mDCs/pDCs for cyokine production in the absence of TLR stimulation are depicted (in some cases because of low variability in the samples, error bars are too narrow to be distinguished). p Values after adjustment for covariates are indicated. B and C, Representative examples of baseline cytokine production; depicted are TNF-α and IL-6 production in mDCs not subjected to TLR ligand stimulation from six young and six older adults. *p < 0.0001. We chose to evaluate cytokine production in DC populations using flow cytometry-based analyses of PBMCs rather than study-purified DCs to minimize manipulations that might result in partial activation of DCs and because purification procedures would substantially decrease the yield of cells for analysis. However, the low percentage of DCs present in the PBMC population raises the possibility that other cell types could contribute to the observed alterations in TLR function in mDCs and pDCs from older compared with young individuals. To evaluate this possibility, we used a combination of negative and positive magnetic bead sorting to isolate DCs that were 70–85% pure in six young and seven older, randomly chosen members of the original cohorts, evaluated 20 to 21 mo after initial enrollment. The lower yield of cells from this procedure allowed us to test only activation by Pam3CSK4 (TLR1/2), LTA (TLR2/6), and R848 (TLR8) in mDCs and R848 (TLR7) and CpG (TLR9) in pDCs. Nonetheless, our evaluation of these enriched DC populations yielded results that were consistent with our observations in PBMCs. We observed statistically significant decreases in p40, IL-6, and TNF-α production in mDCs and IFN-α and TNF-α production in pDCs in response to these ligands in cells from older compared with young individuals (note that these estimates of significance were not adjusted for covariates given the lower number of samples) (Fig. 5). Indeed, for TNF-α production in response to CpG stimulation in pDCs, a significant difference was observed in the recalled subset, whereas no significant difference was observed in the larger cohort when initially evaluated; the reasons for this may in part reflect the fact that the older cohort was nearly 2 y older when recalled. We employed magnetic bead enrichment, instead of cell sorting, because the purity of cell-sorted populations is achieved at the expense of sufficient yield of cells for in vitro studies. Although we cannot exclude the possibility that other cell types could still contribute to the alterations in DC function we observed, even in these highly enriched populations, these results nonetheless indicate that age-associated alterations in mDCs and pDCs contribute to the decreased TLR-induced cytokine production found in cells from older individuals. Age-associated alteration in TLR-induced cytokine production in purified DCs isolated using magnetic bead sorting in six older compared with seven young adults 2 y after the original study. 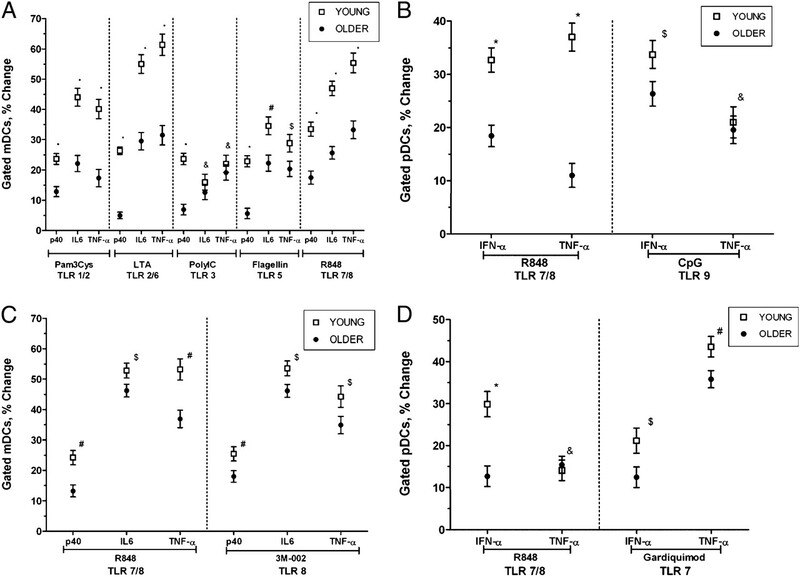 A, Age-associated decrease (n = 13) in IL-12 (p40), IL-6, and TNF-α production in mDCs (as measured by intracellular cytokine staining) following stimulation with indicated TLR ligands. B, Age-associated decrease in IFN-α and TNF-α production in pDCs (n = 13) following stimulation with R848 and CpG. The mean ± SEM percent positive difference in intracellular cytokine production between samples stimulated with the indicated TLR ligand and unstimulated samples are depicted. C and D, Representative examples of TLR ligand-induced cytokine production: depicted are TNF-α and IL-6 production in six young (A) and six older adults (B) after stimulation with TLR7/8 ligand R848. # p < 0.01; $ p < 0.05 using a t-test (note that because of the low number of this sample, these p values were not adjusted for covariates). To determine the basis for our observed age-associated defects in TLR-mediated function in human DCs, we employed flow cytometry to examine the expression of TLRs from DCs of young versus older individuals. We evaluated the surface expression of TLR1 and TLR2 and the intracellular expression of TLR3 and TLR8 in mDCs from young and older individuals; in addition, we determined the intracellular expression of TLR9 in pDCs. We detected decreased expression of TLR1 and essentially unchanged TLR2 expression in mDCs from older individuals, similar to our previous observations in human monocytes (14). In addition, intracellular expression of TLR3 and TLR8 was also decreased in mDCs from older compared with young individuals, whereas TLR9 expression in pDCs appeared unchanged (Fig. 6). Thus, some of the age-associations alterations we observed may result from decreased expression of TLRs in cell surface and intracellular compartments, particularly in mDCs. 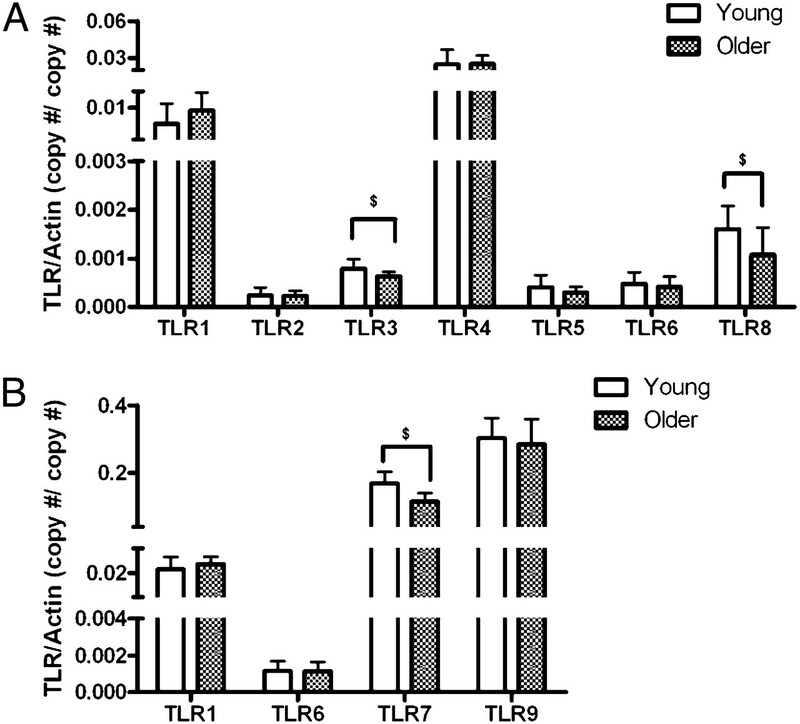 Age-associated decrease in TLR protein expression. 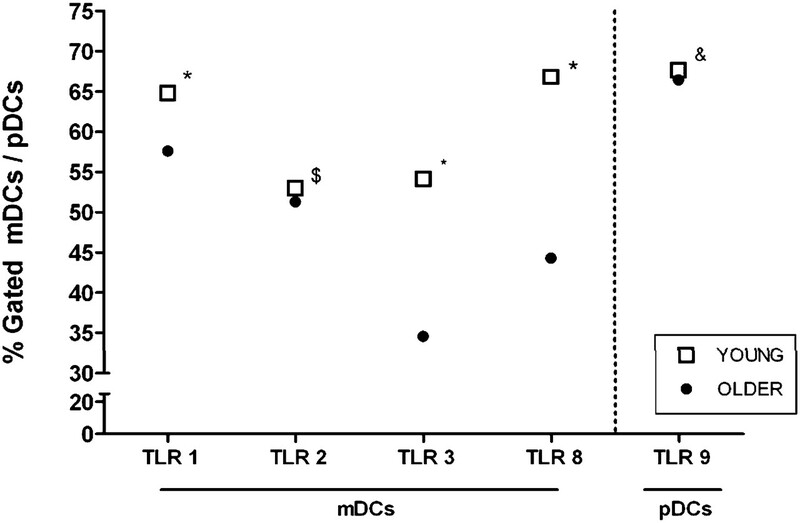 Shown are baseline percent positive mDCs for TLR1, TLR2, TLR3, and TLR8 expression and pDCs for TLR9 expression (compared with isotype control). Values indicate the mean ± SEM (because of the low amount of variability in these samples, in some cases error bars are too narrow to be distinguished) in young (n = 24) and older adults (n = 24). p Values after adjustment for covariates: *p < 0.0001; $ p < 0.05; & p < NS. To determine whether transcriptional mechanisms contribute to the observed age-associated differences in TLR expression, we determined TLR mRNA expression levels using qPCR of highly purified mDC and pDC populations from the young and older groups (n = 20/group). We detected cell-type appropriate TLR expression (i.e., mDCs expressed mRNA for TLR1, -2, -3, -4, -5, -6, and -8, whereas pDCs expressed mRNA only for TLR1, -6, -7, and -9 consistent with earlier reports) (22, 34). When comparing TLR expression from DCs of older versus young individuals, we detected significantly lower levels of TLR3 and TLR8 in mDCs from older as compared with young adults (Fig. 7); similarly, the expression of TLR7 was also significantly lower in pDCs from older compared with young participants (Fig. 7). Although these data indicate that the expression of TLR3, TLR7, and TLR8 in DCs declines with aging, we observed decreases in TLR1/2, TLR2/6, and TLR9-induced cytokine production and protein expression despite unperturbed expression of TLR1, TLR2, TLR6, and TLR9 RNA. Taken together, these findings indicate that both transcriptional and posttranscriptional mechanisms contribute to the observed age-associated defects in TLR function. Effect of aging on expression of TLRs in human mDC and pDC. The data display mRNA expression levels of the indicated TLRs in purified mDCs (A) and pDCs (B) from 40 individuals (young, n = 20; older, n = 20). mRNA levels were quantified by qPCR and normalized to β-actin. The median values and interquartile range are indicated. $ indicates statistical significance between young and older cohort (Mann-Whitney; p < 0.05). We have shown that both mDCs and pDCs from older individuals have reduced TLR expression and function. To assess the effect of these deficits, we assessed the Ab response to immunization with the trivalent 2007–2008 influenza vaccine (A/Solomon Islands/3/2006, A/Wisconsin/67/2005, and B/Malaysia/2506/2004). Serum samples were obtained from 104 young and older participants prior to and 4–6 wk following immunization, and influenza serologies were determined using a standard hemagglutination inhibition assay. As expected, rates of seroconversion (defined as a 4-fold increase between pre- and postvaccine serologies) were substantially lower for older individuals, reflecting the known decreased efficacy of the trivalent inactivated vaccine in this population (Fig. 8). For example, nearly 80% of young individuals seroconverted to the H3N2 and B vaccine strains compared with 8% and 0% of older individuals, respectively; notably, 55% of older individuals failed to seroconvert to any of the three vaccine strains. In addition, we also evaluated whether vaccine recipients generated Ab titers postvaccine that are associated with protection against infection regardless of fold-increase between pre- and postvaccine titers. Defining seroprotection as a postvaccine titer of ≥1:64, we found that older individuals were much less likely than young participants to show seroprotection against strains in the vaccine (Fig. 8). Responses to influenza vaccination in older adults and young adults. A, Pre- and postvaccine titers showing a ≥4-fold increase to each of the influenza strains in the 2007–2008 vaccine (A/Solomon Islands/3/2006-like [H1N1], A/Wisconsin/67/2005-like [H3N2], and B/Malaysia/2506/2004-like [B]) are shown (n = 50 young; n = 54 older). B, The proportion in each age group with a ≥4-fold increase in titer to none, one, two, or all of the vaccine strains. C, Pre- and postvaccine hemagglutination inhibition titers ≥1:64. D, The proportion in each age group with a postvaccination titer ≥1:64 to none, one, two, or all of the vaccine strains. For seroprotection, we excluded members of the cohort who had prevaccine titers of ≥1:64 who therefore already met criteria for protection prior to vaccination. 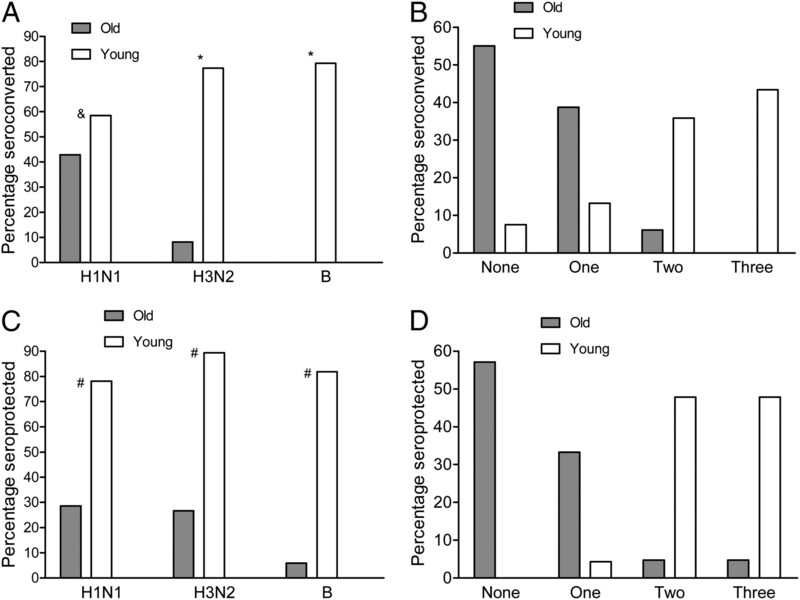 Consequently, the analysis of seroprotection included n = 32 young and n = 49 older for the H1N1 vaccine strain; n = 47 young and n = 30 older for H3N2; and n = 44 young and n = 34 older for the B strain. p Values after adjustment for covariates: *p < 0.0001; # p < 0.01 for difference in distribution in A and C.
We found that TLR-induced production of TNF-α, IL-6, and IL-12/p40 in mDCs and IFN-α and TNF-α by pDCs was significantly associated with seroconversion to the H3N2 and B strains in the 2007–2008 influenza vaccine; moreover, TLR-induced production of IL-12/p40 in mDCs and of TNF-α and IFN-α in pDCs was significantly associated with seroprotection to all three strains in the vaccine (Fig. 9). Taken together, these findings indicate that the defects in TLR-induced cytokine production we have observed have consequences for the generation of a protective Ab response to influenza immunization. Prediction of Ab responses to the 2007–2008 influenza vaccine by TLR-induced cytokine production in mDCs and pDCs. Data depict the least squares mean of TLR-induced cytokine production. A, Association of seroconversion to vaccine strains indicated with TLR-induced production of p40 subunit of IL-12, IL-6, and TNF-α in mDCs. B, Relation of seroconversion to indicated vaccine strains with TLR-induced IFN-α and TNF-α production in pDCs. C, Relation of seroprotection to indicated vaccine strains TLR-induced production of p40 subunit of IL-12, IL-6, and TNF-α in mDCs. D, Relation of seroprotection to indicated vaccine strains with TLR-induced IFN-α and TNF-α production in pDCs. p Values after adjustment for covariates are indicated: *p < 0.0001; # p <0.001; & p < NS. Using intracellular staining to detect cytokine production, we evaluated TNF-α, IL-6, and IL-12p40 production following stimulation with a wide range of TLR ligands. We observed a broad ranging, statistically significant decrease in production of these cytokines in response to all TLR ligands tested in both mDCs and pDCs from older compared with young individuals. This age-associated decrease in TLR function was stable for TLR7 and TLR8 over a 6-wk period and was also evident in for TLR1/2, TLR2/6, and TLR7/8 evaluated in magnetic bead-enriched mDCs and pDCs evaluated in a subset of this cohort nearly 2 y later. These alterations in TLR function are more extensive than the limited defect in TLR1/2-induced production of TNF-α and IL-6 we described previously in monocytes from older individuals (14). Taken together, these results indicate a substantial decrease in TLR function that provides evidence for immunosenescence in human DCs. The older individuals in our cohort represented a largely healthy aged group, with nearly 80% reporting no major comorbid conditions; notably, we did not employ limiting enrollment criteria, such as SENIEUR, a protocol selecting for successfully aged individuals that excludes perhaps 80% of older individuals (35). Our aim was to obtain a generalizable cohort of community-dwelling older individuals and to adjust for the heterogeneity in the cohort by using mixed-effect multivariable analysis. Such control for covariates among young and older groups strengthens the validity of our findings. To understand the basis for the defects in TLR-induced cytokine production we observed, we evaluated surface and intracellular expression of specific TLRs expressed in mDCs and pDCs. We found decreased protein expression for all TLRs in mDCs for which Ab reagent availability allowed analysis: TLR1, TLR2, TLR3, TLR5, and TLR8. By contrast, TLR9 protein expression in pDCs appeared unperturbed. To determine whether transcriptional mechanisms contributed to these age-associated decreases in protein expression, we carried out qPCR analysis of the expression of genes encoding TLRs using highly purified samples of mDCs and pDCs isolated using cell sorting. We demonstrated a statistically significant, age-associated decrease in the expression of TLR3 and TLR8 in mDCs and of TLR7 in pDCs; gene expression of other TLRs appeared equivalent in DCs from young and older individuals. Thus, for TLR3 and TLR8 in mDCs and TLR7 in pDCs (although the lack of an appropriate anti-TLR7 Ab precluded evaluation of protein expression), transcriptional mechanisms could contribute to the observed age-associated alterations in cytokine production. However, it is also possible that the magnitude of these differences in transcription may not be sufficient to account for the changes in TLR protein expression we observed. Of note, we observed a statistically significant age-associated defect in TLR3-induced IL-12 (p40) production, but not TNF-α or IL-6; whether TLR3-dependent TNF-α or IL-6 production may be altered in aging individuals under other conditions (e.g., differing or combination ligand concentrations) or whether for these cytokines a threshold for TLR3 signaling is maintained despite decreased TLR3 gene and protein expression remains to be determined in future studies. By contrast, mRNA for TLR9 expression in pDCs was unchanged between young and older individuals despite functional deficits in TLR9-induced IFN-α production in pDCs from older participants. This finding suggests a potential role for posttranscriptional mechanisms, such as those we reported in the TLR1 defect associated with aging in human monocytes (14). For example, it is notable that the TLR chaperone PRAT4a is critical for the proper surface expression of several TLRs, including TLR1 but not TLR2, and for the proper localization of intracellular TLRs, such as TLR9 (36). It is attractive to speculate that age-associated defects in chaperone function represent one potential mechanism contributing to posttranslational defects in TLR-induced cytokine production. Previous studies in humans using a limited range of TLR ligands have reported age-associated defects in LPS-induced IL-12 production in mDCs (also assessed via intracellular cytokine staining) (37) and decreased IFN-α production as measured by ELISA following stimulation of PBMCs with HSV (32), results consistent with our findings. In contrast, other recent studies have demonstrated increased production of TNF-α, IL-6, and IFN-α from monocyte-derived DCs from older compared with young participants in response to TLR ligands (38, 39). It is likely that the use of disparate experimental systems account for differences with our findings (e.g., derivation of DCs from GM-CSF and IL-4 treatment of monocytes in vitro versus our study of primary mDCs and pDCs). The functional significance of our data is emphasized by the finding that the decreases in TLR-induced cytokine production we observed are strongly associated with the inability to mount a protective Ab response to the trivalent inactivated influenza vaccine currently recommended for all individuals over the age of 65 y. 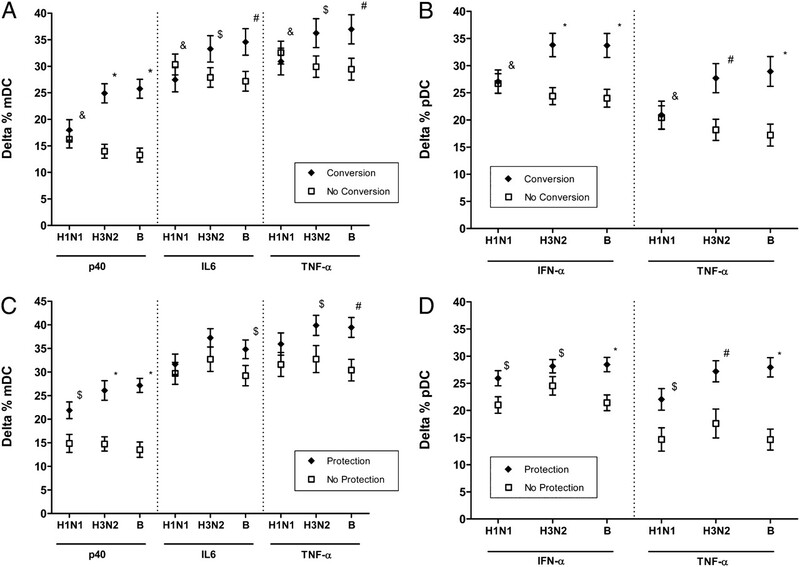 We observed significant associations between seroprotection and IFN-α and TNF-α production in pDCs or p40 production in mDCs to all three strains in the 2007–2008 vaccine; in addition, strong associations between seroconversion and cytokine production were observed for the H3N2 and B strains in the vaccine. Trends suggesting a relationship between seroprotection or seroconversion and cytokine production were observed that were not significant in some cases (e.g., the H1N1 strain and seroconversion). Whether this reflects differences in immunogenicity among strains in the vaccine is unclear; nonetheless, these findings contrast with our previous studies in monocytes, which did not demonstrate an association between TLR-induced cytokine production and influenza vaccine Ab response (14). We observed a strong relationship between aging and defects in TLR-induced cytokine production in DCs, but it is notable that the relationship between cytokine production and seroconversion to influenza immunization was significant regardless of age (in this context, because age and seroconversion were strongly associated, they cannot be independent variables in the same statistical model). Consequently, our results are applicable to the general population receiving influenza vaccine and provide further evidence linking TLR function to adaptive immune responses. Although the specific TLR ligands present in the influenza vaccine are uncharacterized, the strength of the association we observed with vaccine Ab response suggests that TLR-dependent cytokine production is an indicator for the integrity of the aging innate immune system. Indeed, the decreases we observed in TLR-induced cytokine production in mDCs and pDCs are likely to have a substantial impact on innate immune responses in older individuals, ranging from altered proinflammatory responses mediated by TNF-α and IL-6 to CD4 T cell polarization mediated by IL-12 to type I IFN-dependent antiviral responses (in which pDCs play a crucial role) (40, 41). 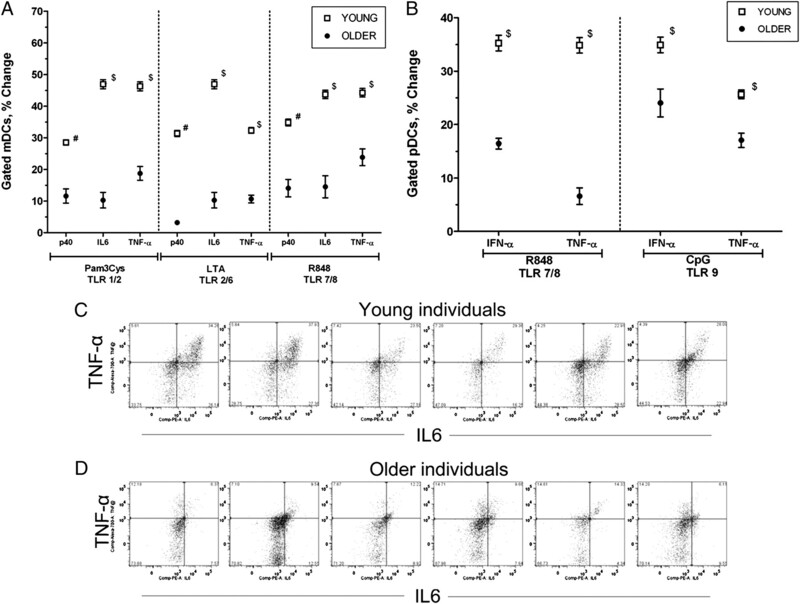 Consequently, it is attractive to speculate that these alterations in TLR expression and signaling in DCs, combined with other age-associated findings in monocytes and macrophages from aging individuals, such as decreased costimulatory protein expression (13–15), could further diminish B and T cell function (42, 43) in contributing to the impaired host responses to infection and immunization characteristic of the aging immune system. Our findings do not exclude the possibility that aberrant elevations in baseline cytokine production render DCs less responsive to TLR stimulation; such a scenario may contribute to reports of a heightened proinflammatory environment that is particularly associated with disability in aging individuals (33); indeed, our observation that basal levels of intracellular cytokine staining are markedly elevated in mDCs and pDCs from older, compared with young, individuals that were not stimulated with TLR ligands is consistent with the hypothesis that proinflammatory cytokine production in DCs is dysregulated in older individuals. Future research is needed as to whether the inability to further increase cytokine production in response to stimulation by pathogen-associated molecular patterns via TLRs will adversely affect the ability of the innate immune system to facilitate the development of the adaptive immune response. Additional studies of TLR-dependent responses, particularly in older human cohorts with increased functional disability, are needed to address this question. A recent report by Jing et al. (Aging is associated with a numerical and functional decline in plasmacytoid dedritic cells, whereas myeloid dendritic cells are relatively unaltered in human peripheral blood. Hum Immunol. 70: 777–784) reported age-associated decreases in human pDC number and IFN-α production. We thank Donna Carrano, Sandra Ginter, MaryLou Breitenstein, and Linda Leo-Summers for valuable assistance, Tobi Kollman (University of British Columbia) and Chris Wilson (University of Washington) for assistance with FACS analysis, and members of the Yale Program on Aging and the Yale IMAGIN team for insightful discussions. This work was supported in part by the National Institutes of Health (N01-AI-50031, AI 070343) and the Center of Excellence in Aging at Yale University and funded in part by the John A. Hartford Foundation and the Claude D. Pepper Older Americans Independence Center at Yale University (P30 AG021342). E.F. is an Investigator of the Howard Hughes Medical Institute.
. 2002. The aging of the immune system. Adv. Immunol. 80: 243–284.
. 2004. Age-related changes in lymphocyte development and function. Nat. Immunol. 5: 133–139.
. 2003. Ineffective humoral immunity in the elderly. Microbes Infect. 5: 1279–1284.
. 2004. Innate immunity in aging: impact on macrophage function. Aging Cell 3: 161–167.
. 2000. Effect of age on human neutrophil function. J. Leukoc. Biol. 67: 40–45.
. 2001. Neutrophil ageing and immunesenescence. Mech. Ageing Dev. 122: 1521–1535.
. 1990. Interferon-gamma-induced priming for secretion of superoxide anion and tumor necrosis factor-alpha declines in macrophages from aged rats. FASEB J. 4: 2906–2911.
. 2002. In vivo dehydroepiandrosterone restores age-associated defects in the protein kinase C signal transduction pathway and related functional responses. J. Immunol. 168: 1753–1758.
. 2007. Antiviral signaling through pattern recognition receptors. J. Biochem. 141: 137–145.
. 2004. Toll-like receptors in the pathogenesis of human disease. Nat. Immunol. 5: 975–979.
. 2008. Dysregulation of TLR3 impairs the innate immune response to West Nile virus in the elderly. J. Virol. 82: 7613–7623.
. 2007. Age-associated defect in human TLR-1/2 function. J. Immunol. 178: 970–975.
. 2007. Prevaccine determination of the expression of costimulatory B7 molecules in activated monocytes predicts influenza vaccine responses in young and older adults. J. Infect. Dis. 195: 1590–1597.
. 2008. Systematic expression profiling of innate immune genes defines a complex pattern of immunosenescence in peripheral and intestinal leukocytes. Genes Immun. 9: 103–114.
. 2008. Influence of aging on murine neutrophil and macrophage function against Candida albicans. FEMS Immunol. Med. Microbiol. 53: 214–221.
. 2002. Cutting edge: impaired Toll-like receptor expression and function in aging. J. Immunol. 169: 4697–4701.
. 2008. Aging impairs IFN regulatory factor 7 up-regulation in plasmacytoid dendritic cells during TLR9 activation. J. Immunol. 181: 6747–6756.
. 2004. Age-dependent decrease in Toll-like receptor 4-mediated proinflammatory cytokine production and mitogen-activated protein kinase expression. J. Leukoc. Biol. 75: 342–349.
. 2005. Aging negatively skews macrophage TLR2- and TLR4-mediated pro-inflammatory responses without affecting the IL-2-stimulated pathway. Mech. Ageing Dev. 126: 1305–1313. 1982. Concepts and Procedures for Laboratory-Based Influenza Surveillance . U.S. Department of Health and Human Services. National Institutes of Health, Bethesda, MD .
. 1982. Random-effects models for longitudinal data. Biometrics 38: 963–974.
. 1997. Linear Mixed Models in Practice: A SAS-Oriented Approach. Springer, New York.
. 1989. Generalized Linear Models. Chapman and Hall, London.
. 1984. Age-related decline of human interferon alpha and interferon gamma production. Blut 48: 285–289.
. 2002. Age-related changes in human blood dendritic cell subpopulations. Scand. J. Immunol. 55: 453–457.
. 2002. Circulating, interferon-producing plasmacytoid dendritic cells decline during human ageing. Scand. J. Immunol. 56: 518–521.
. 2001. Specialization and complementarity in microbial molecule recognition by human myeloid and plasmacytoid dendritic cells. Eur. J. Immunol. 31: 3388–3393.
. 1984. Admission criteria for immunogerontological studies in man: the SENIEUR protocol. Mech. Ageing Dev. 28: 47–55.
. 2007. A protein associated with Toll-like receptor (TLR) 4 (PRAT4A) is required for TLR-dependent immune responses. J. Exp. Med. 204: 2963–2976.
. 2007. Peripheral blood dendritic cells and monocytes are differently regulated in the elderly. Clin. Immunol. 122: 220–228.
. 2007. Altered innate immune functioning of dendritic cells in elderly humans: a role of phosphoinositide 3-kinase-signaling pathway. J. Immunol. 178: 6912–6922.
. 2009. Increased reactivity of dendritic cells from aged subjects to self-antigen, the human DNA. J. Immunol. 182: 1138–1145.
. 2005. Functional diversity and plasticity of human dendritic cell subsets. Int. J. Hematol. 81: 188–196.
. 2009. T-cell immunosenescence: lessons learned from mouse models of aging. Trends Immunol. 30: 301–305.
. 2009. CD28(-) T cells: their role in the age-associated decline of immune function. Trends Immunol. 30: 306–312.